A paraglider accused of ‘abusive and hostile’ behaviour in a seaside town has hit back at the claims branding them ‘lies’. Sussex Police launched an appeal for witnesses as they investigate claims that a man has been waging a two year reign of terror on Bexhill-on-Sea in Sussex. 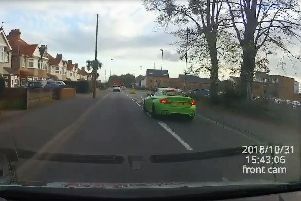 A force spokesperson said: ‘Over the past two years Sussex Police has received reports of the para-glider causing criminal damage, obstructing the highway, being abusive and hostile towards members of the public and generally behaving in an anti-social manner. However a man identifying himself as the paraglider called into a popular radio station and denied flying low to annoy people. Claiming to have been paragliding for 25 years he dismissed the complaints. ‘I'm a free-flying spirit and I live to fly and fly to live,’ the man told LBC radio host James O'Brien, who addressed the caller as Paul. Asked if he was intimidating people on the seafront, he laughed and said: ‘No. I'm just there to fly. The man uses Galley Hill, Bexhill-on-Sea, as a launch site. Sussex Police's probe is being carried out in conjunction with the Civil Aviation Authority. A spokesman for Rother District Council said it has had ‘numerous interactions with him over recent years’.